Description This Atlanta, Georgia hotel has an indoor pool, free internet access, non-smoking guest rooms, an on-site restaurant and free breakfast. Beautiful city views and high-tech amenities GÇö including iPod docks and HDTVs GÇö are the hallmarks of the gleaming non-smoking J.W. Marriott Hotel Buckhead Atlanta. The non-smoking glass-walled J.W. Marriott stands out even in upscale Buckhead. Its public rooms are elegant and vast and the lobby lounge is clubby and sophisticated without feeling exclusive. All 371 accommodations come with 37-inch flat-panel HDTVs pillow-top mattresses premium linens marble baths and iPod docking stations. Additional nice touches include bathrobes in the closet a free newspaper at your door every morning and complimentary shoe shines. Wi-Fi is available for a fee. The grill restaurant open for three meals a day is set in an English garden. For fun head to the skylight-lit indoor pool. There's also an on-site fitness studio sauna and steam room. If work has brought you to town feel free to take advantage of the business center. Self and valet parking are available for a fee. The J.W. Marriott is connected to the Lenox Square Mall. It's three miles from the governor's mansion and 15 minutes from Midtown where you'll find museums a botanical garden and excellent restaurants. Turner Field and the Georgia Dome are 20 minutes from the hotel. Hartsfield-Jackson Atlanta International Airport is 18 miles away. 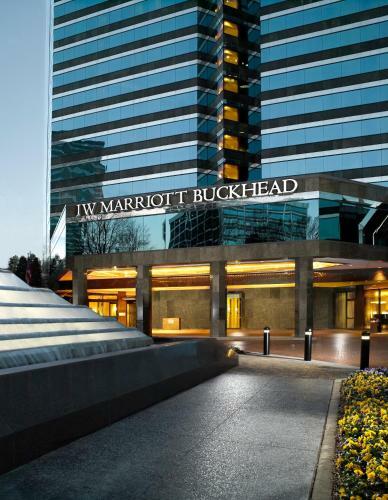 Add Jw Marriott Atlanta Buckhead to your free online travel itinerary.